Buying a fuel-efficient car is only one weapon in the battle against road traffic emissions. Just as important is how the car is driven, as this can have a huge bearing on the amount of fuel used. Following a few simple rules can reduce harmful greenhouse gases and save money. Before setting off, reduce the weight in the car by removing items that are not needed for the journey. Golf clubs, buggies and tools can often be left in the boot and losing the extra weight will improve fuel consumption. Roof racks should be taken off if not needed, as the wind resistance they cause increases fuel consumption. Try to avoid filling the tank to the very brim at the pumps. Fuel is heavy, so the more fuel in the tank the less fuel efficient the car will be. If the car is well maintained and the engine properly tuned, its performance and fuel economy will improve. It is important to check tyre pressure too, as under-inflated tyres can increase fuel consumption by up to three per cent. Plan the journey to get as much out of it as possible and reduce the chance of getting lost. One journey with half a dozen stops is better for the environment and the pocket than six separate trips. It is worth asking whether or not the journey justifies using the car at all - if it's less than half a mile, try walking. Try to cut travel time by avoiding congested areas and only travel in rush hour if absolutely necessary. Delaying the journey or setting off early to avoid busy times can reduce the time spent in the car. Sharing trips, such as the school run, is another money saver that cuts traffic emissions. There is no need to run the engine or pump the accelerator before setting off, as this wastes fuel and modern engines are designed to get going straight away. Change up a gear at the right time - at 2000 revolutions per minute in diesel cars and 2500rpm in petrol cars - to make dramatic savings. A car travelling at 37 miles per hour in third gear uses 25 per cent more fuel than at the same speed in fifth gear. Switch the engine off altogether if the car will not be moving for a while. Keeping an eye on speed can make a big difference too, as travelling at 70mph can use up to 30 per cent more fuel than at 50mph. 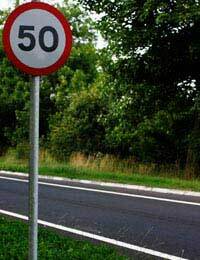 It's just as important not to go too slow, as speeds of less than 15mph create the most pollution. As speed increases to 60mph, pollution drops, but pollution increases again above 60mph. Try to avoid wasting fuel on rapid acceleration and harsh breaking by taking careful consideration of the road ahead and anticipating traffic. Drive with the windows up to reduce wind resistance, which burns fuel, and use air conditioning and other on-board electrical devices sparingly as they increase fuel consumption. If there is no onboard computer in the car, it is easy to calculate how much money eco-driving can save. Simply fill the car up and then keep track of how many miles are travelled. When it's time to visit the pumps again, take note of the mileage and fill the tank to the same level, recording the litres of fuel needed. Now divide the mileage by the litres used and multiply by 4.546 to covert to miles per gallon. The result may be surprising.